With the cold weather just around the corner for the majority of the country, the time has come to start thinking about how you will keep your home warm. Space heaters can be an economical way of keeping certain places in your home nice and warm without overheating other areas. They can also be used in unheated spaces such as the garage or an enclosed porch. We have reviewed dozens of space heaters to identify those that would make excellent choices for anyone looking for this type of appliance. We looked at value, safety, energy efficiency, and how well the heaters work for their given applications. If you’re looking for a more permanent fixture, check out our review of the best electric fireplaces and stoves. Enjoy full-room coverage with widespread oscillation! The clear pick when it came to choosing the best space heater was the Lasko 6435 Designer Series Ceramic Oscillating Heater with Remote Control. With an oscillating design, this space heater can heat up an entire room quickly and efficiently. It features several safety features, too! 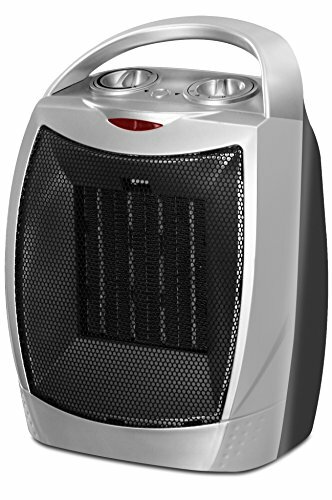 The Lasko 6435 Designer Series Ceramic Oscillating Heater with Remote Control was our top pick. For full-room coverage, this type of heater can’t be beat; the oscillation and the self-regulating ceramic element will keep the room comfortably warm without it getting too hot. There is an adjustable thermostat and a 7-hour timer with an automatic shut off, which makes it perfect for overnight warmth. You can also decide whether you’d like the air flow to be low or high. This space heater is safe, too. It has automatic overheat protection, so you won’t need to worry that it will get too hot if you’re not in the room. It comes fully assembled for your convenience, and it is a 1500 watt appliance. No need to get out of bed to make it warmer or cooler, since it includes a remote control. Safety and energy-saving options make this a great choice. 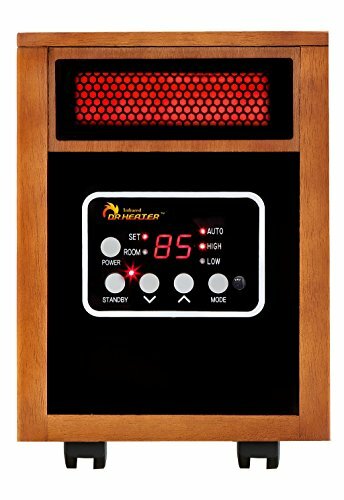 If you need to heat a large room, you can’t go wrong with our runner-up pick, which is the Dr Infrared Heater Portable Space Heater. This is a 1500-watt energy-saving model. You can decide whether you want the air to blow at a high or low setting, and you can choose a temperature between 50 and 86 degrees. It comes with a remote control, and the noise level is under 40 decibels, so it will provide some nice white noise without keeping you up at night. The heater comes with a 12-hour automatic shut-off timer, overheat protection, and tip-over protection to enhance your safety. The filter is good for a lifetime, and caster wheels make it easy to move. The unit weighs 24 lbs. A great value for a safe and effective space heater. The Utopia Home Ceramic Space Heater provides good warmth for small and medium-sized rooms, as well as great safety at a price that will meet just about anyone’s budget. It has two power settings, an adjustable thermostat, and multiple fan settings. There’s a power indicator light and a handle to allow the unit to be moved easily. It is extremely easy to operate. The space heater has an overheat protection system and also a tip-over switch that will turn off if the unit is knocked over. It also has a safety PTC heating element. A convenient-sized heater perfect for warming up small and medium rooms. 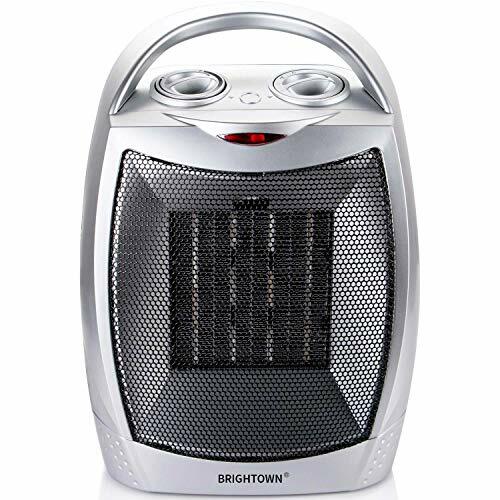 The Brightown 750W/1500W ETL Listed Quiet Ceramic Space Heater may be small, measuring at 6 x 7 x 9″, but it packs a big punch. Perfect for medium-sized rooms (and smaller), this heater has three settings to allow for high heat, low heat, and a cooling fan. The ceramic heating element provides soothing heat that can be adjusted with the thermostat control. In addition to great warming potential, this space heater has overheat protection for your safety and to protect the heater itself if it gets too hot. It will shut off automatically if the element gets too hot. It also comes with a 1-year guarantee. Create ambiance along with warmth with this beautiful space heater. 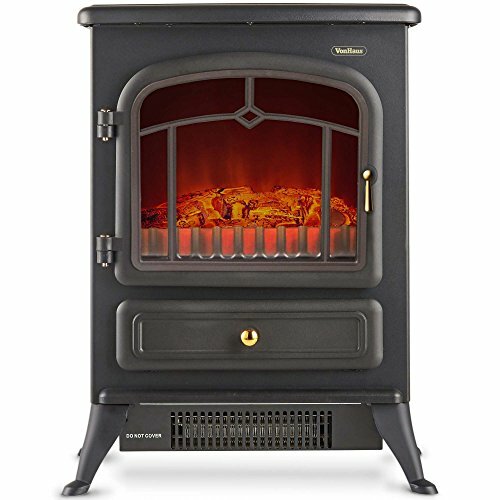 The VonHaus Electric Fireplace Stove Heater offers the classic, elegant look of a vintage stove heater along with the ability to heat a room up to 150 square feet. The unit comes with two settings high and low, and it also has realistic features such as bronze effect handles and a large display window. The realistic vivid flame effect provides a beautiful, soft glow without any of the risks associated with a real log fire. You can use the unit as a decoration without the heat turned on on warmer days. It is equipped with a safety thermal cut-off feature to provide additional safety. A space heater can be an economical, energy-efficient choice for many different situations. Many people find that one or two rooms in the house are cooler than the rest of the house, so a space heater can allow you to heat those rooms without turning up your whole-house thermostat, saving you money on your energy bills. Another reason to use a space heater is if you are only using one room in your home during any time period. You can turn down the thermostat on your central heating system and simply bring your space heater into the room you are in. A portable unit is a good choice, in this case. If you have a space that is not attached to your central heating system (such as a garage or the basement), a space heater can provide you with the comfortable climate control you need without having to add heating lines or duct work to your space. And finally, if you choose a gas- or kerosene-powered space heater, you can use it if the electricity goes out, keeping you warm and safe in case of a bad winter storm. A space heater should have several important features. Here are some to consider before you purchase a space heater for your home. Energy efficiency. Since one of the reasons you might be purchasing the heater is to save on your heating bills, it only makes sense to look for a space heater that is energy-efficient. Safety features. Any space heater you use should have safety features such as an automatic shutoff in case of overheating and either a no-tip design or a shutoff in case the unit does tip over. You will also want to be sure that the space heater you use is approved for indoor use if you plan to use it indoors. Adjustable thermostat. For most uses, you will want to have an adjustable thermostat, even if that just means you can put the unit on high or low. In some cases, such as if you plan to only use it for a short time to warm up a room in a warmer climate, this might be unnecessary. Portability. If you are going to use the heater in just one room, this is not an issue, but if you plan to take the space heater with you into different rooms, you will need to be sure you can carry or roll it and that there is a handle you can use to make it easier. What is a space heater and how does it work? A space heater is a heater that heats one room of your home. It is not tied to your central heating system and it operates independently from your furnace, monitor heating system, wood-burning stove, or whatever appliance you are using to heat the rest of your home. There are different types of space heaters. Radiant space heaters warm the air around the unit which mixes with the cooler air and raises the room’s temperature. Some heaters blow warm air into the room. Still others function as decorative faux fireplaces, adding figurative warmth in addition to literal warmth. What is the most efficient space heater type? Electric space heaters are 100% efficient because they do not leave any fuel leftover. Look for one that is marked “energy efficient” and check the efficiency ratings. Some electric space heaters are less efficient than others in the sense that they use more electricity and will raise your utility bill. Halogen heaters and oil-filled radiators are often among the most inexpensive to use. 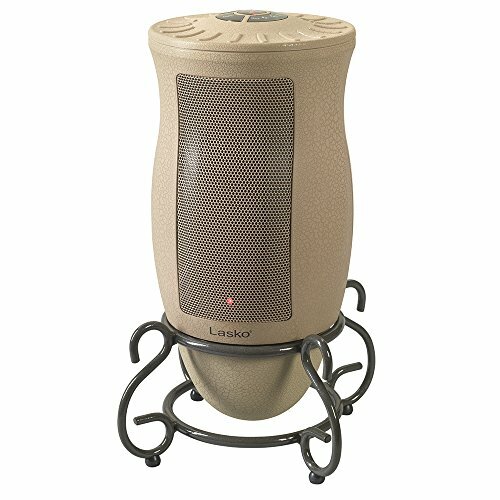 What’s the best location for a space heater? The answer to this question depends on the type of heater. Ceramic heaters usually use a fan to force warm air into the room. They come in different sizes and capabilities; some are better for large areas and some are better for small areas. Because they make some noise, you might like them in the bedroom to provide white noise or you might prefer to look for something silent if you require total quiet to sleep. Radiant heaters and infrared heaters often heat larger areas than forced-fan heaters. If you have a home with an open floor plan, an infrared heater will usually be able to heat the whole main living area. Both of these types of heaters can be used in rooms like bedrooms and offices. Convection heaters are also good for warming large spaces such as a finished garage or a basement. They are hot to the touch, however, so they are not appropriate for areas where small children and pets will be playing. Yes, when used properly, space heaters are safe. There are safety considerations to keep in mind. For example, if you have small children, you will want to be sure that the heater you choose is cool to the touch. Also, look for safety features like overheating and tip-over shutoff. Only use space heaters indoors if they are specifically made for indoor use. There are some space heaters designed for open garages and patios that could cause a buildup of harmful fumes in the house. Follow the manufacturer’s instructions to ensure your safety. We looked at 20 other space heaters. Even though they didn’t make our top 5, they’re still the best of the rest and solid picks for those needing to enhance the warmth of their homes. The information needed to compare each one is included with the listings. If you have a room that needs consistent heating, this radiant heater provides energy-efficient radiant heating power. Great for large rooms or open floor plans! This space heater features quick heat-up and silent operation. Best for medium to large rooms, this space heater provides constant heat while maintaining a low surface temperature. This oil-filled radiant heater maximizes the amount of heat available in a room while keeping a low surface temperature for safety. With cool touch housing and a tip-over shut-off safety feature, this space heater is safe to use even if you have children or pets. This radiant space heater has five temperature settings ranging from 65 to 85 degrees, ensuring your comfort whether you prefer to be mildly warm or very warm. This kerosene heater is extremely energy-efficient, providing 15 hours of heat in a large room or open area (up to 999 square feet) on only 1.1 gallons of kerosene. This radiant space heater heats up to 500 square feet. It is convenient to use with an automatic ignition and one-touch shut-off for safety and peace of mind. This Dyna-Glo model is a convection oven. It heats up to 525 square feet, so it is appropriate for most large rooms. It has safety features and it will work during a power outage. If you have a large space that needs to be heated, this portable convection kerosene space heater can handle warming up to 1,000 square feet for up to 12 hours at a time with under two gallons of kerosene. If you are looking for a versatile heater that can handle indoor and outdoor applications, this one might be perfect. It can heat up to 14 hours and comes with safety features. This space heater is ideal for home or office use. With three settings and several safety features, you will be comfortable and safe while saving on your utility bill. This fan-style heater has two heating settings as well as a fan-only mode, so you can make it as warm or cool as you need. The heater also oscillates for maximum heating in a space. This is a personal space heater, so it provides just the temperature you want in a small package. It is very portable, so you can take it to work or from one room to another with ease. If you are looking for a small, portable heater without a lot of bells and whistles, this Honeywell model might suit you perfectly. It has a cool touch carry handle for maximum portability. Excellent for a small room or a personal office, this value-priced fan heater will keep you comfortably warm without breaking the bank. Picture yourself gathered with your friends and family around this vent-free electric fireplace on a cold winter day. Log flame effect with five levels of brightness. Available in three attractive colors, this electric fireplace plugs into a standard 120-volt outlet and warms areas up to 1,000 square feet. Perfect for a large living room or an open floor plan. This safe and efficient ceramic fireplace heater lends the look of realistic embers with or without heat. This hearth stays soot-free and you’ll benefit from the warm glow. The charming look of a glowing log and ember bed can be yours! This pretty heater provides supplemental heating for up to 400 square feet. This lavish and baroque-style design looks extremely realistic. Its lightweight construction allows you to move it for room to room for the ultimate in versatility!